It's not what you think. There are times when this resort town I live in goes a bit crazy. This time of year would be one of them. There are ongoing festivals although I don’t know if the chopper convention would exactly qualify as a festival but judging by the sounds I am hearing they are apparently quite happy. The cupboards I have been dutifully painting all week are starting to affect my lungs and my pallid relationship with Mr. Eraser, amazing as he is, is growing tiresome. While the new paint job is off-gassing I step out into the crowd. The sunshine is infectious. Immediately my spirits lift as I take in the market hubbub, get my tarot read, and drift casually over for some garlic braid shopping. It’s my birthday after all. I sit at a table catching up on magazines and wonder why every page seems to feature the word “bucolic”, or “iconic”, and when overstretched “elan". With a Portobello mushroom burger, I stretch out and hear drifts of conversation from off-islanders.. Time wasted is well spent as these summer days dwindle, the nights cool, and blackberries ripen. It feels good to off-gas. was staying with me. We remarked to each other that Turdus had a particularly bright yellow beak and the white band around his eyes seemed emphasized somehow. All robins started to take on a nightmarish quality for me and something benign and theoretically cheerful began to feel Hitchcockish. It seemed to me the robin was following me around the property, watching me from the roof eve, and hopping nearby me in the garden. One day I came home and the robin was sitting on the lawn outside the gate waiting for me. Our eyes locked. Ignoring the situation, I came into the house to begin the task of unloading the groceries when suddenly, the robin flew at the sliding glass doors with wings fully outspread. My heart thumping, I thought, “He is trying to come into the house!” I walked into the next room and he flew at those windows too this time leaving beak marks as he tapped. Chills went through me. “You couldn’t make this stuff up if you tried,” I thought to myself. “This is so weird.” On a subsequent trip to a nearby nursery, I mentioned to the owner what I was going through. 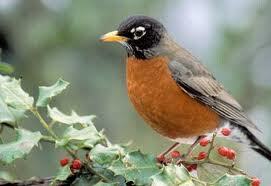 The nursery owner said he had a degree in biology and he felt that the robin was going after his own reflection. “Maybe,” I thought uncertainly, inwardly feeling there was a component missing to this theory. The tapping on the window continued and the smear marks increased and then the day came that he came to the window ledge where I write at my desk, not an easy feat mind, as the ledge is aluminum and quite narrow. He had a large wiggly worm in his beak and he was looking at me as though he was presenting to me something quite wonderful, much like a man with a diamond engagement ring. He seemed so pleased with himself. “Am I being courted?” I wondered. Friends and family visited, there was much coming and going, the robin disappeared, and I forgot about dear Turdus, worms not exactly being the key to my heart but feeling somewhat more warmly now nonetheless. I assumed he had gone off with a much more feathered wife to nest somewhere. This week, he is back. “Is that you?” I silently asked trying to assess the white band around the eye as I quietly went about my business in the yard. Quoth the robin, “Nevermore.” I am just thankful the tapping has stopped. When I returned to my home after being away for an extended time I strode across the yard and sensing a presence hesitated. I turned and saw an enormous owl on my garden post gazing intently at me. I froze and tiptoed gently in retreat. He was huge. His head swiveled and followed me into the house and he gazed unblinkingly at me through the window for two to three hours. I took this to be a good sign. I have been wondering about the owls, of course, especially as I have been walking in the twilight and listening to their rasp down the road by the canal. 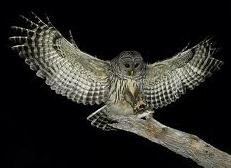 As the night deepened an owl swooped down close to my head. Hello, I said softly. Then he did it again. It felt very special. I began to wonder why I am seeing owls everywhere. A couple of days ago at the lake, in broad daylight, an owl and I had a good look at each other. I was motionless for many minutes not wanting to be the first to break the trance. It brought to mind the words of Clarissa Pinkola Estes, raconteur extraordinaire, in her Mother Night series, for she says the owl sees what others do not and is able to penetrate the mystery of the dark. Feeling somehow like I am being drawn into a mystery myself I contacted an ornithologist friend, asking about the rasps. “Why are they not hooting?” I wondered. “Sounds like Barred Owls,” he wrote to me. He added they are juveniles asking for food from parents who are trying to wean their young. I learned that this breathy rasping sound is the juvenile Barred Owl (Strix varia) begging. I can say with authority, there is a lot of weaning going on around here then. One would think that given they are teenagers there will be hooting soon and hopefully less pesky vermin. Indeed this does bode well. This island where I live is fairly civilized but occasionally there are reminders of how it used to be. This week I was looking on the community notice board and it went something like this. “Cougar, a bit bigger than my friend’s female Golden Retriever, spotted this morning sunning itself.” Last night I ventured trepidatiously forth into the crisp moonlight where an owl was hooting and rasping. Rasping? Owls rasp? I realized he was very close and crept around the house trying to decide if he really was on my porch. He called and not wanting to frighten him off I lay down in the silver light listening. As I mentally reviewed cougar attack protocol, suddenly the bush to the side of me cracked loudly. My heart pounded as a buck bounded away. I relaxed and thought uncharitably, oh good, a decoy, and made my way confidently in the night. Well at least the bear sightings were over a month old, I muttered to myself, as I closed the front door with a testy shove.